Things are humming here in Hawley, Massachusetts. 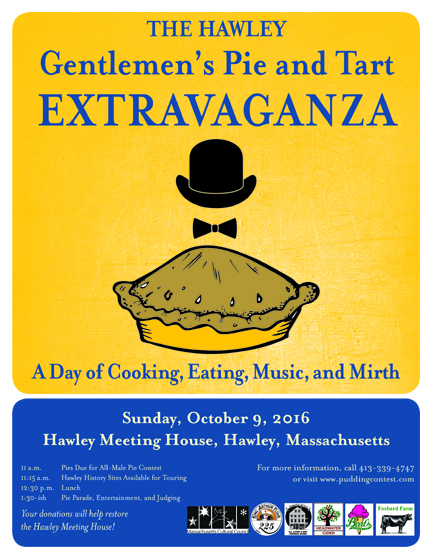 In just over a week—on Sunday, October 9—the Sons & Daughters of Hawley will host the Hawley Gentlemen’s Pie and Tart Extravaganza! This event is modeled after our occasional pudding contest. It was inspired by two sentences I turned up in an old book many years ago while doing research for Hawley’s bicentennial. For years several of Hawley’s men—my friend Peter in particular—have lobbied for a revival of the pie-baking contest. No one has lobbied for a revival of the wood-sawing contest so we’re ignoring that. But we are at last holding a men’s pie contest as a fundraiser for the ongoing restoration of the Hawley Meeting House. It will be open to men and boys who come from other places, of course. And it should offer fun for women as well as men. The day will include a tour of historic sites, a sumptuous lunch, a pie parade, and an entertainment in which we reenact the circumstances of the original pie contest. Of course, we have no idea what those circumstances were. We don’t even know what kind of pie Clarence Gould made or precisely when he made it. That won’t stop us from telling a fun story involving music, vegetarianism, and a chicken named Jerusha. Please join us if you can—and spread the word! It may be another 100 years before we revive the contest once more. Here is a recipe to get male readers started. It comes from my friend Michael Collins, now semi-retired as a chef. Michael’s main responsibility is cooking filling breakfasts for the guests at the Bed and Breakfast establishment he and his partner Tony now run at their home in Colrain. 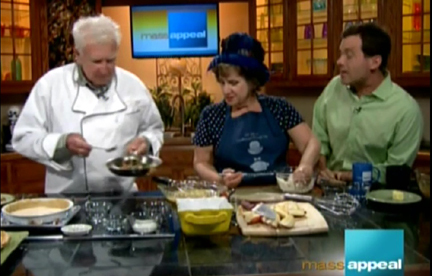 Michael came on Mass Appeal with me this week to show how quickly one can assemble a pie. I prepared my Rustic Apple Tart, and he threw together this quiche-like concoction. The herbs and the mushrooms gave it rich flavor. And we had fun as always cooking together. Fry the bacon in a pan. Take it out, but do not remove the grease from the pan. Drain the bacon on paper towels, and crumble it. Sauté the mushrooms in the remaining bacon grease. Return the crumbled bacon to the pan, and toss. 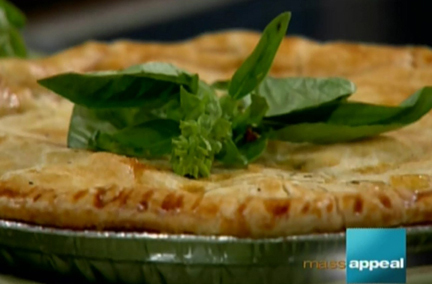 Place the fried bacon and mushrooms in the bottom pie crust. Whisk together the eggs, milk, herbs, and seasonings. Pour the egg mixture over the bacon and mushrooms. Place top crust on the pie. Make a few holes in the top for ventilation. Bake for 10 minutes. Reduce the heat to 350 degrees, and bake for about 30 minutes more, until golden brown. This entry was posted on Thursday, September 29th, 2016 at 1:12 pm	and is filed under Apples and Cider, Cakes, Pies, and Pastry, Eggs. You can follow any responses to this entry through the RSS 2.0 feed. You can leave a response, or trackback from your own site. Thank you! We had fun making the pies, as you can tell.